At first, I wasn’t so sure I liked this book, but by the time I had finished, I felt differently. I didn’t love the story, but his writing drew me in and pulled me along. I was curious to know what was going to happen to this poor man in the end. I found it hard to really like any of the characters in Cockroach, but easy to feel sorry for them. The main character, himself, seemed to like very few people, which only served to increase his isolation. With the exception of women (one in particular) he seems to despise, envy, or ridicule everyone he knows and meets. He also feels everyone looks down on him because he is poor or because he is an immigrant. Do Canadians see immigrants this way? Or is it “just a story”? Cockroach is the fourth book I’ve read from the 2014 Canada Reads Top 5 list. The question for Canada Reads 2014 is, how would this book be the one book to change the nation? I will be interested to hear what Samantha Bee has to say about it. In my opinion, so far, I would rank the other three I’ve read ahead of it. (Annabel, The Year of the Flood, and The Orenda). Has anyone else read this? I would be interested in knowing what you think this book is about and how it has the potential to change the nation. 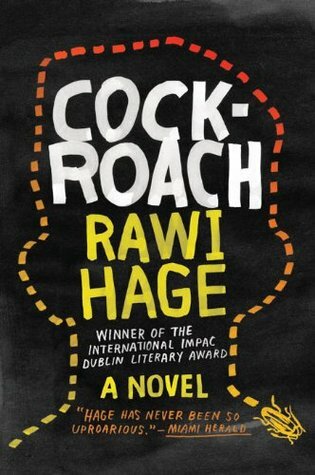 Rawi Hage was born in Lebanon, lived through 9 years of the Lebanese civil war, and immigrated to Canada in 1992. Cockroach is his second book. His first book, De Niro’s Game is set during Lebanon’s civil war, and, based on the quality of writing in Cockroach, I think it will be added to my to-read list. Of all the Canada Reads books this year, this is the one I’m not so keen on reading. I’ve never read anything by Hage, and out of all his book this is not the one I’d choose. And I’ve already pinned my hoped on THE YEAR OF THE FLOOD to win. Love the book, love Stephen Lewis. It’s a winning combination. It’s not my first choice either, but it was a pretty quick read, and I will be glad to have read it when March comes around. I’m very curious to see what Samantha Bee has to say about it. I also loved The Year of the Flood, but I loved Annabel and The Orenda as well. I’m having a hard time making up my mind. I think my favourite book so far is The Orenda, but does that mean it is the best choice for the theme this year? I haven’t decide yet. Let me know what you think when you’re done!